In the East Lake community, however, all was not as auspicious as it seemed. While Woods struggled through his first tournament at East Lake the leaders of the community’s public housing development were preparing for their day in court, demanding a halt to the redevelopment. The tenant association of the neighborhood’s soon to be demolished public housing project believed that their voices were not only being silenced as part of the redevelopment process, but that the Atlanta Housing Authority was breaking the legal contract outlining their redevelopment. In response, the tenant association filed litigation demanding an injunction to stop the demolition of their homes. The tenants lost the litigation, their homes were demolished, and a majority of them never returned to the newly constructed mixed-income community. Moreover, their critical voices, which had reverberated around the halls of East Lake Meadows and throughout the city, have been largely forgotten in East Lake’s history. 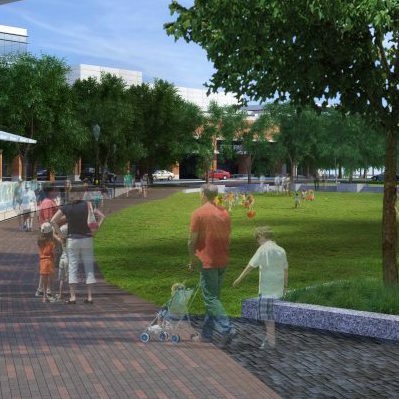 In many ways, the redevelopment of the East Lake neighborhood is a remarkable success story. 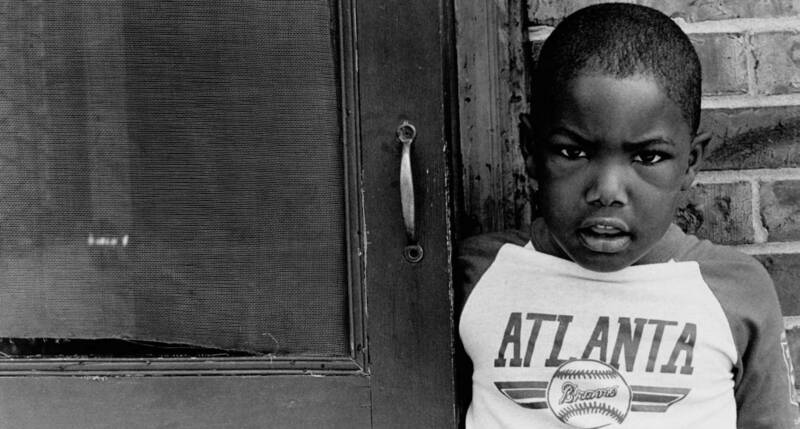 In the early 1990s East Lake, which is located five miles east of downtown Atlanta, was one of the poorest and most violent communities in the city, the anchor of which was the East Lake Meadows public housing project. 2 Bobby Jones’s home course had fallen into disrepair alongside the community. Beginning in 1993, however, Tom Cousins, a wealthy real estate developer with a passion for golf, realized that he could bring the golf course back to championship grade and use the course’s revitalization as a catalyst to lift the community out of poverty. Thus began a redevelopment process that has presently made East Lake the home of the state’s highest ranked charter school, a 50/50 market-rate and publicly assisted housing community, a YMCA, an early learning center, a grocery store, and a well-endowed and community-focused foundation. Yet for all its success, East Lake’s story serves more as a model of community replacement than community development. The poor being served at East Lake today are not the same kind of poor who were forced to live in an underfunded and underpoliced East Lake Meadows. The poor who inhabit the new East Lake meet requirements that include having a full time job and a clean criminal record. 3 Almost 90 percent of the poor who lived in the old East Lake were unemployed, and the neighborhood’s crime rate was eighteen times the national average. 4 Those poor, like many of the thousands that inhabited severely distressed public housing units in the 1990s, either happily left their bleak living conditions in search of a safer community, or watched from afar as their public housing developments were demolished and the redeveloped mixed-income community welcomed a more “deserving” poor. This essay relies on the news archives of the Atlanta Journal-Constitution, the archives of the Atlanta Housing Authority, and the memories of those involved in the redevelopment to piece together a detailed account of the relationships between the Atlanta Housing Authority, Cousins, and the East Lake Meadows residents. 5 This story is told alongside the wider history of public housing in East Lake in order to illustrate that the redevelopment at East Lake, touted by many as a gold standard for community development, is more an example of community replacement than community development. 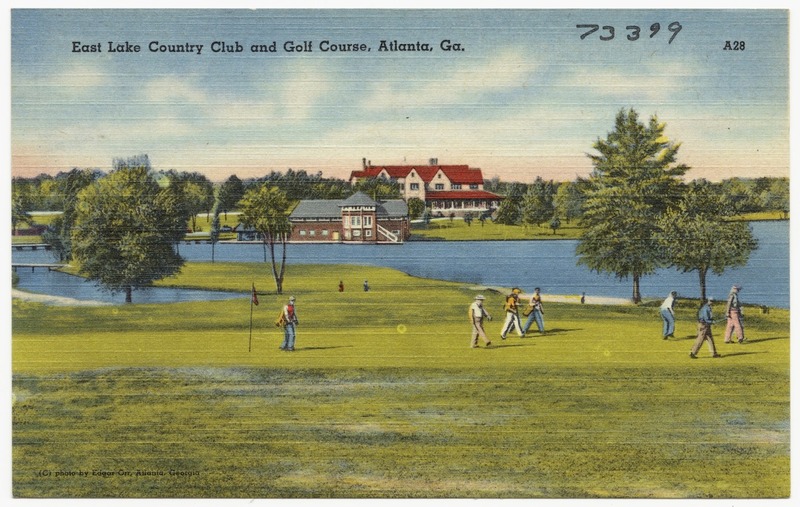 “East Lake Country Club and Golf Course, Atlanta, Ga.” Card. 1930. The Tichnor Brothers Collection, Boston Public Library. 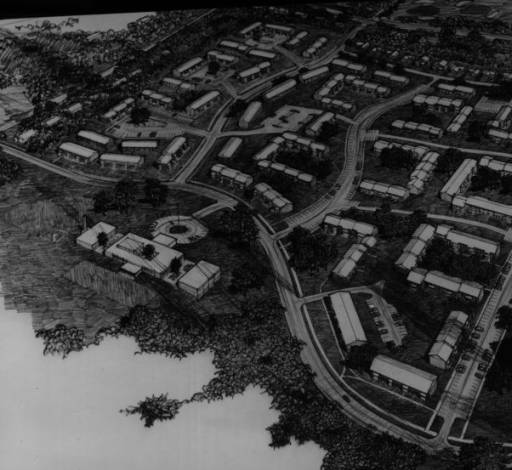 Drawing depicting an aerial view of East Lake Meadows, a public housing project built on area formerly occupied by a golf course, Atlanta, Georgia, September 1969. AJCP551-062u, Atlanta Journal-Constitution Photographic Archives. Special Collections and Archives, Georgia State University Library. Copyright Atlanta Journal-Constitution. Courtesy of Georgia State University. The Athletic Club evolved with the East Lake neighborhood. In 1965, they announced the sale of East Lake’s No. 2 course, a nine-hole course adjacent to the original eighteen-hole course, to developers interested in zoning the land for apartments. 10 Three years later, in April 1968, the club’s directors informed their membership that they were selling all of their East Lake property. To keep the historic course from meeting the same fate as East Lake’s No. 2 Course, twenty-five members purchased the land. 11 These men established the East Lake Country Club, and for the next twenty years attempted to maintain the course’s relevance while the neighborhood transformed around it. 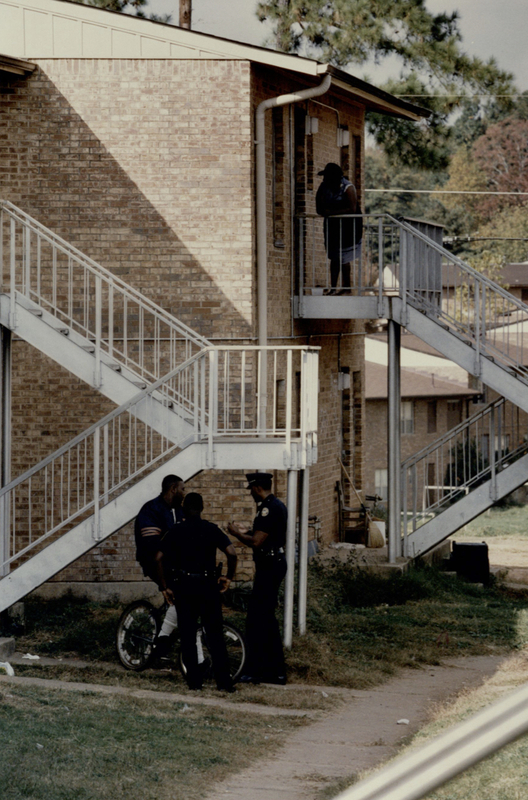 “Police officers outside of an East Lake Meadows apartment, October 28, 1992.” Photo by Walter Stricklin. AJCP183-042u, Atlanta Journal-Constitution Photographic Archives. Special Collections and Archives, Georgia State University Library. Copyright Atlanta Journal-Constitution. Courtesy of Georgia State University. 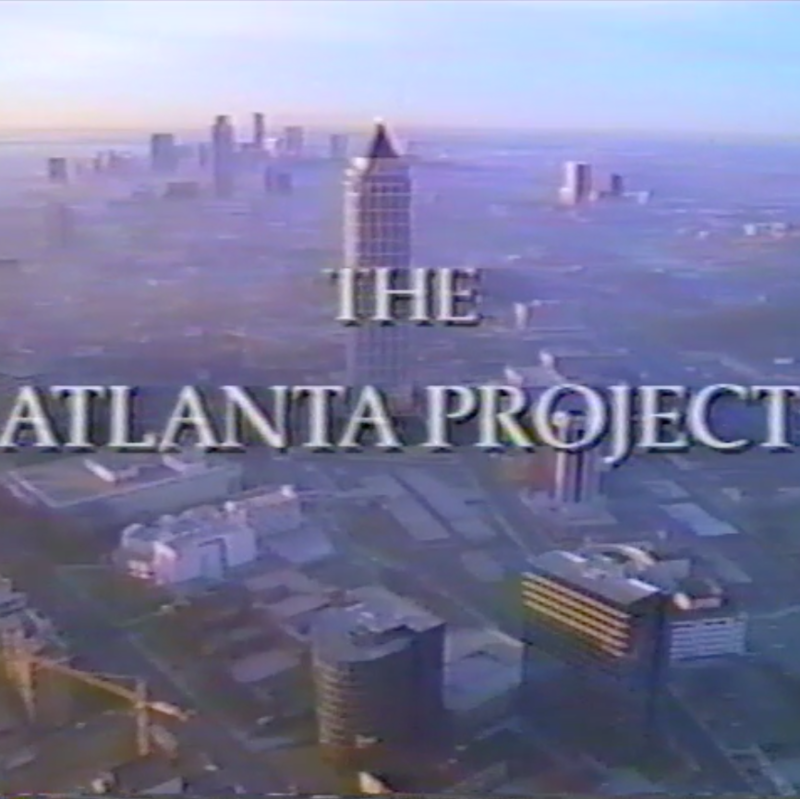 In late October 1992 the Atlanta Project announced its first success at East Lake. In a reported “direct, behind the scenes appeal,” Carter successfully lobbied HUD to budget $33.5 million for the Atlanta Housing Authority to renovate East Lake Meadows. Eva Davis viewed the money as a “miracle,” and an answer to everything that the residents had been asking for. 29 They saw the funds being used for everything from replacing the electrical system to installing new furnaces in every unit. But before The Atlanta Project and the residents of East Lake Meadows could begin to fully conceptualize how the $33 million could be spent, an unexpected Atlantan entered the fray and altered the city’s visions of the redevelopment possibilities at East Lake. In mid-November 1993, the development firm Cousins Properties purchased the East Lake Golf Club for $4.5 million. 30 Cousins Properties, founded in 1958 by a then twenty-six year old Atlantan named Tom Cousins, was one of the most successful real-estate companies in the country. Within six years of its founding, the company was the largest home builder in Georgia. Cousins Properties is responsible for much of the Atlanta skyline, including the Omni Hotel and the Bank of America building. 31 Cousins had a longtime passion for golf and interest in the East Lake Country Club. 32 In purchasing the East Lake Country Club, Cousins was determined to bring the course back to its former glory. Brochure for “The Atlanta Project.” The Atlanta Project coordinator’s records, Emory University Archives, Stuart A. Rose Manuscript, Archives, and Rare Book Library, Emory University. Copyright The Carter Center. Courtesy Rose Library, Emory University. 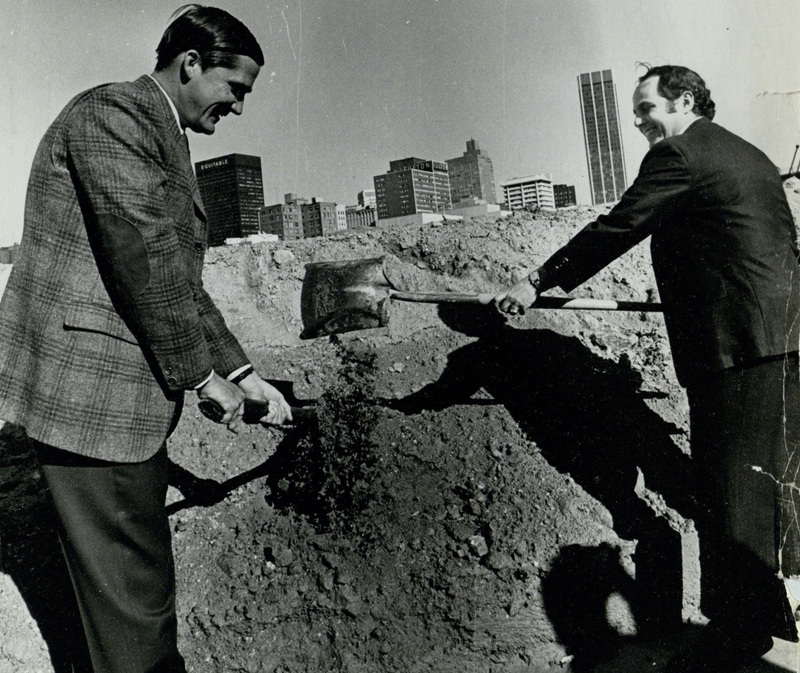 Tom Cousins and Mayor Sam Massell breaking ground for the Atlanta Coliseum, March 31, 1971. Photo by Charles R. Pugh. AJCP276-051by, Atlanta Journal-Constitution Photographic Archive. Special Collections and Archives, Georgia State University Library. Copyright Atlanta Journal-Constitution. Courtesy of Georgia State University. 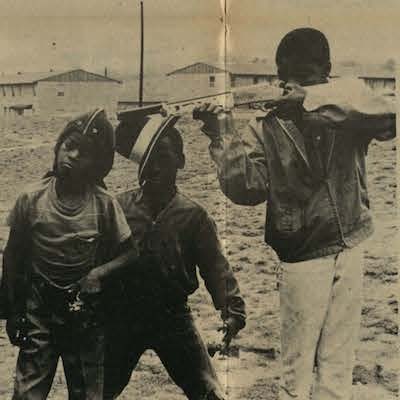 In 1994 Cousins also began planning the revitalization of what he believed to be at the center of the neighborhood’s problems – the East Lake Meadows public housing project. Cousins worked with his colleagues at the East Lake Golf Club and his foundation, as well as with city officials, to devise the plan for “The New Community at East Lake.” Cousins began speaking with the Atlanta Housing Authority about a redevelopment plan at the Meadows. His ideas proved attractive to Renee Glover, a former Wall Street corporate lawyer who had recently joined the board of the Atlanta Housing Authority. Glover entered into the fray of the Housing Authority during a time of rampant mismanagement and was appointed CEO in September 1994, determined to radically reshape the institution. Meadows residents immediately began to worry about the plan’s consequences. Vivian Louise Featherstone, a sixty-seven year old Meadows resident, remembered thinking, “Where are we going?” and “how will we survive?” Now, in addition to the bullets, she felt she had to fear Cousins’ and Glover’s bulldozers as well. Eva Davis vowed to reject the plan. “A lot of residents feel like this is a sneaky way to get rid of us,” Davis said. She believed that Cousins and Glover were “just pushing [the residents] away from the golf course.” 39 Many of the residents were worried about the stark reduction in the number of public housing units – from 650 to 206 – and the lack of planning for replacement housing. The agreement also promised that the residents would have “significant involvement … in the planning and implementation phases” of the development. 47 The involvement of residents at every step of the process and the focus on minimizing displacement seemed promising to Meadows residents. In the following year, however, residents grew to believe that the promises laid out in the agreement were not being met, leaving them angry, disappointed, and unsure whether Glover and Cousins had ever had their best interests in mind. 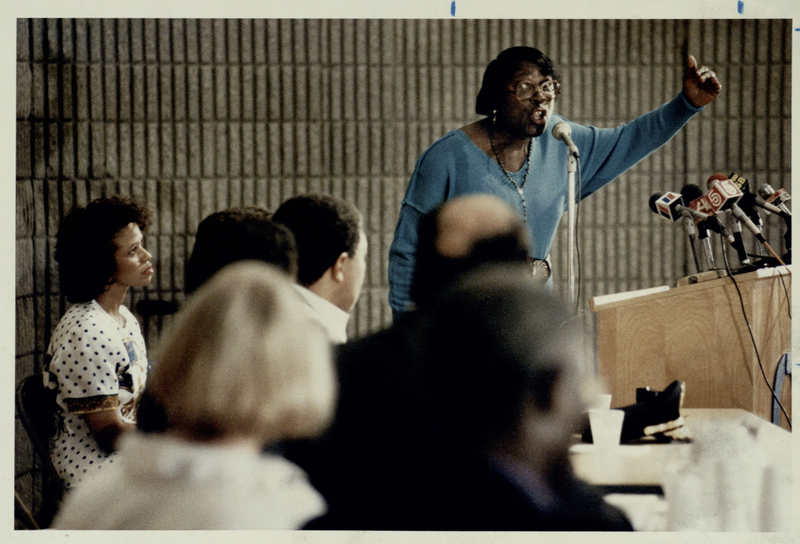 “EVA DAVIS SPEAKS DURING A PANEL AT THE DISTRICT 5 EMERGENCY TOWN HALL MEETING AT ALONZO A. CRIM HIGH SCHOOL, NOVEMBER 17, 1991.” PHOTO BY MARLENE KARAS. AJCP183-042n, ATLANTA JOURNAL-CONSTITUTION PHOTOGRAPHIC ARCHIVES. SPECIAL COLLECTIONS AND ARCHIVES, GEORGIA STATE UNIVERSITY LIBRARY. COPYRIGHT ATLANTA JOURNAL-CONSTITUTION. COURTESY OF GEORGIA STATE UNIVERSITY. Photo by W. A. Bridges. AJCP183-042t, Atlanta Journal-Constitution Photographic Archives. Special Collections and Archives, Georgia State University Library. Copyright Atlanta Journal-Constitution. Courtesy Georgia State University. Clearly, the Villages of East Lake is a healthier and more supportive community for its households on public assistance than East Lake Meadows was for the thousands who called it home. What is problematic is when the East Lake’s story is used as a model for community development around the country. This view is touted by the PGA Tour every fall, and is supported by Cousins and other members of Atlanta’s political and business elite through widely read editorials in national newspapers. Purpose Built Communities, a non-profit supported by Cousins and other major philanthropists dedicated to replicating East Lake around the country, tells the same story. These individuals and institutions highlight before-and-after snapshots that showcase statistics such as educational achievement, employment rates, and crime rates that have improved remarkably since the redevelopment. This is a powerful narrative, one that lends credence to the notion that East Lake is a model that could be applied to other poor neighborhoods in cities across the country. The history of East Lake, however, is more complicated. These outcomes reflect what can happen when an extremely impoverished community is replaced with a less impoverished one. As inspiring as it is, East Lake’s story is not a case study in community development, but instead a case study in community replacement. Brandon Thrasher in front of his East Lake apartment home. Louie Favorite, AJCP183-042f, Atlanta Journal-Constitution Photographic Archive. Special Collections and Archives, Georgia State University Library. Copyright Atlanta Journal-Constitution. Courtesy of Georgia State University. Adam Goldstein is a Bobby Jones Scholar at the University of St. Andrews studying affordable housing policy. He graduated from Emory University in 2016. This article stems from his senior thesis in history written under the direction of Joseph Crespino. “David King and Barbara Smith stand on the front porch of their East Lake Meadows apartment building, November 21, 1991.” AJCP183-042p. Photo by W. A. Bridges, Jr.. Atlanta Journal-Constitution Photographic Archive. Special Collections and Archives, Georgia State University Library. Copyright Atlanta Journal-Constition. Courtesy of Georgia State University. 1. ↵ Clifton Brown, “Golf Course at the Center of a Community; Developer’s Dual Initiative Revives Atlanta Neighborhood,” New York Times, October 29, 1998, http://www.nytimes.com/1998/10/29/sports/golf-golf-course-center-community-developer-s-dual-initiative-revives-atlanta.html. 2. ↵ Edward Goetz, New Deal Ruins: Race, Economic Justice & Public Housing Policy (Ithaca: Cornell University Press, 2013), 105. 3. ↵ “Eligibility,” Atlanta Housing Authority, accessed January 30, 2017, http://www.atlantahousing.org/for_participants.php. 4. ↵ David C. Lewis, “How Golf Transformed a Blighted Neighborhood,” CNBC, April 22, 2008, http://www.nbcnews.com/id/24185797/ns/business-cnbc_tv/t/how-golf-transformed-blighted-neighborhood/#.WKTPERIrKqA. 5. ↵ Interviews were carried out by the author, and where claims of fact are made by interviewees, they were corroborated with archival sources. 6. ↵ “History of East Lake Golf Club,” East Lake Country Club, accessed January 12, 2016, http://www.eastlakegolfclub.com/about-us/history/. 7. ↵ Sidney Matthew and Janice McDonald, East Lake Golf Club (Atlanta: Arcadia, 2015), 67, and Ted Simmons, “Athletic Club to Consider Selling East Lake’s no. 2 Course to Builder,” Atlanta Constitution, January 5, 1963. 8. ↵ Kevin Kruse, White Flight: Atlanta and the Making of Modern Conservatism (Princeton, NJ: Princeton University Press, 2005), 234. 9. ↵ United States Census Bureau, 1960 Atlanta Census Tracts: 150–55 and United States Census Bureau, 1970 Atlanta Census Tracts: 215–30 and United States Census Bureau, 1980 Atlanta Census Tracts: 117–27. 10. ↵ Ted Simmons, “Athletic Club Votes to Sell Golf Course,” Atlanta Constitution, January 21, 1965. 11. ↵ C. Roberts, “Big Battle Is Underway to ‘Save’ Old East Lake,” Atlanta Constitution, March 28, 1968. 12. ↵ Alex Coffin, “Bankhead Site Okayed For Low-Cost Housing,” Atlanta Constitution, October 6, 1967. 13. ↵ Alex Coffin, “East Lake No. 2 Zoned for Housing Coffin,” Atlanta Constitution, June 5, 1968. 14. ↵ Maggie McCarty, “Introduction to Public Housing,” Congressional Research Service, January 3, 2016. 15. ↵ Alex Coffin. “East Lake No. 2 Zoned for Housing,” Atlanta Constitution, June 5, 1968, and Alex Coffin, “East Lake Course Zoned for 800 Housing Units,” Atlanta Constitution, May 24, 1968. 16. ↵ Nat Sheppard, “Area Poor Get Homes,” Atlanta Constitution, January 31, 1971. 17. ↵ Bill Seddon, “Poor Services Plague Area.” Atlanta Constitution, January 18, 1972. 18. ↵ Chet Fuller and John Head, “Public Housing: It Will Take Much, Much More Than Money, Bricks or Mortar to Solve the Ugly Dilemma of the People Who Must Live Here,” Atlanta Constitution, November 10, 1974. 19. ↵ Chuck Bell, “East Meadows Center Is ‘Almost’ a Reality,” Atlanta Constitution, September 6, 1972. 21. ↵ Goetz, New Deal Ruins, 105. 22. ↵ Barry King and George Rodrigue, “Jail Would Be Nicer than Some AHA Apartments,” Atlanta Constitution, January 14, 1981. 23. ↵ Barry King, “Violence In ‘Little Vietnam,’” Atlanta Constitution, March 2, 1979. 24. ↵ See more at “City Housing Authority Loses Third Board Member in a Year,” Atlanta Constitution, November 9, 1980, and Barry King and George Rodrigue, “Report Says Employees May Be Robbing Housing Authority Blind,” Atlanta Constitution, January 14, 1981. 25. ↵ Barry King and George Rodrigue, “A Model in Public Housing Debased,” Atlanta Constitution, January 15, 1981. 26. ↵ Pamela Fine, “Housing Authority to Lose $5 Million in Federal Funds,” Atlanta Constitution, March 23, 1982. 27. ↵ Douglas Blackmon, “Carter Visits East Lake; Former President Says Curing Ills May Take Years,” Atlanta Journal-Constitution, November 27, 1991. 28. ↵ Douglas Blackmon, “East Lake; Can Gulf Between Two Worlds Be Bridged?” Atlanta Journal-Constitution, December 22, 1991, and Renee Glover, “The Toxic Impact of Concentrated Poverty,” Lessons Learned, August 17, 2009, http://ahalessonslearned.blogspot.com/2009/08/toxic-impact-of-concentrated-poverty_17.html. 29. ↵ Lyle Harris, “$33.5 Million for East Lake Meadows Project to Get Major Overhaul; Tenant Leader Hails Funding as ‘a Miracle’,” Atlanta Journal-Constitution, October 29, 1992. 30. ↵ Mary Louise Kelly, “Reviving a Legendary Country Club: An Atlanta Developer Wants to Return East Lake to its Former Splendor, When the Legendary Bobby Jones Played Golf There,” Atlanta Journal-Constitution, November 23, 1993. 31. ↵ “Reaching New Heights,” Cousins Properties, accessed February 23, 2016, http://cousinsproperties.com/about-us/history/. 32. ↵ Patricia Sellers, “More Than a Game Tom Cousins Chose an Unlikely Centerpiece – a Golf Course – to Revive an Atlanta Neighborhood. Is His Project a Model for Other Cities?” Forbes, September 3, 2001. 33. ↵ Macon Morehouse, “New Lease on Life for East Lake? ; Rebirth: New Neighborhood Would Boast Mixed-income Housing, Recreation Area and a Public Golf Course,” Atlanta Journal-Constitution, June 1, 1995, and Glenn Sheeley and S. A. Reid, “Bringing Golf to Public Housing; Foundation Hopes Eat Lake Rehabilitation Project Will Turn Area Around,” Atlanta Journal-Constitution, June 18, 1995. 34. ↵ SECF Channel, “Tom Cousins Purpose Built Communities,” filmed [June 2013], Youtube video, 30:39, posted [June 2013], https://www.youtube.com/watch?v=cat5LfGPkNE. 35. ↵ Paul McLarty, phone interview by the author, February 9, 2016. 36. ↵ Lawrence Vale, Purging the Poorest: Public Housing and the Design Politics of Twice-Cleared Communities (Chicago: University of Chicago Press, 2013), 108–14. 37. ↵ No relation to the author. 38. ↵ Frank Alexander, interview by the author, January 15, 2016. 40. ↵ Darryl Fears and Charmagne Helton, “East Lake Redevelopment; ‘Where Are We Going?’; Tenant Opposition: Public Housing Residents Are Concerned the Mixed-income Proposal Will Force Them to Relocate,” Atlanta Journal-Constitution, June 2, 1995. 41. ↵ Macon Morehouse, “Revised Plan Pushed for East Lake; Residents Contend More Homes Needed,” Atlanta Journal-Constitution, June 14, 1995. 42. ↵ Frank Alexander, interview by the author. 43. ↵ S. A. Reid, “East Lake Pact: ‘Great Step Forward’,” Atlanta Journal-Constitution, January 26, 1996. 44. ↵ Atlanta Housing Authority, Redevelopment Cooperative Agreement by and Between the Housing Authority of the City of Atlanta, Georgia and East Lake Meadows Residents Association (Atlanta: Atlanta Housing Authority, 1996), 1–4. 45. ↵ Housing vouchers refers to section 8 of the 1974 Housing and Community Development Act that emphasized the use of cash subsidies in addition to unit production as part of the federal housing strategy. For more, see Charles J. Orlebeke, “The Evolution of Low‐Income Housing Policy, 1949 to 1999,” Housing Policy Debate 11, no. 2 (2000): 489–520. 46. ↵ Atlanta Housing Authority, Redevelopment Cooperative Agreement, 3, 7–9. 48. ↵ Dennis Goldstein, interview by the author, February 7, 2016. 49. ↵ Doug Faust, interview by the author, February 26, 2016. Giornelli was reached out to for comment but noted that he was often out of town and unavailable to comment on the project. He recommended Evan Smith, who was interviewed for this project, to fill in. 50. ↵ Dennis Goldstein, interview by the author. 52. ↵ “Cousins Asks Developers to Duplicate East Lake,” Atlanta Business Chronicle, December 8, 1997. 53. 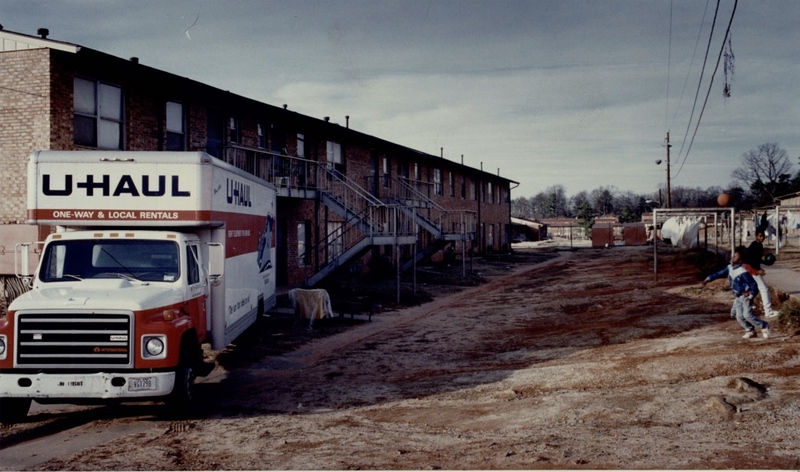 ↵ Villages at East Lake Records Collection, Atlanta Housing Authority Archives Collection, Atlanta Housing Authority, December 8, 2015. 54. ↵ Hollis Towns, “Rebuilding Dispute; East Lake Residents Seek to Oust Developers,” Atlanta Journal-Constitution, March 5, 1998. 55. ↵ Hollis R. Towns, “East Lake Residents Might Sue; Housing Woes: Residents of the Housing Project Are Upset They Can’t Temporarily Move Into Newly Built Townhouses Meant to Replace Old Apartments,” Atlanta Journal-Constitution, September 24, 1998, and Frank Alexander, interview by the author. 56. ↵ Dennis Goldstein, interview by the author. 57. ↵ Ray Glier, “East Lake Changes Course of Its Neighborhood,” Washington Post, November 1, 1998. 58. ↵ Frank Alexander, interview by the author. 59. ↵ East Lake Meadows Residents Association v. The Housing Authority of the City of Atlanta, Georgia (1998), Civil Action – Order – Superior Court (Superior Court of Fulton County 1998). 60. ↵ Hollis R. Town, “East Lake Residents Dealt Legal Setback; Tenant Leader, Others Are Ordered to Move After Judge Vetoes Their Suit to Slow Redevelopment of Public Housing Complex,” Atlanta Journal-Constitution, December 17, 1998. 62. ↵ Cynthia Tucker, “The Villages of East Lake: Hope From the Ground Up; Urban Model: Mixed-income Community That Replaced Beleaguered Housing Project Focuses on Spiritual and Economic Growth,” Atlanta Journal-Constitution, October 17, 1999. 63. ↵ Dennis Goldstein, interview by the author. 64. ↵ Doug Faust, interview by the author.